Ladies! You don’t want to miss our next major event in Chicago! Grab a plane, train or automobile but get to the city for this epic event. 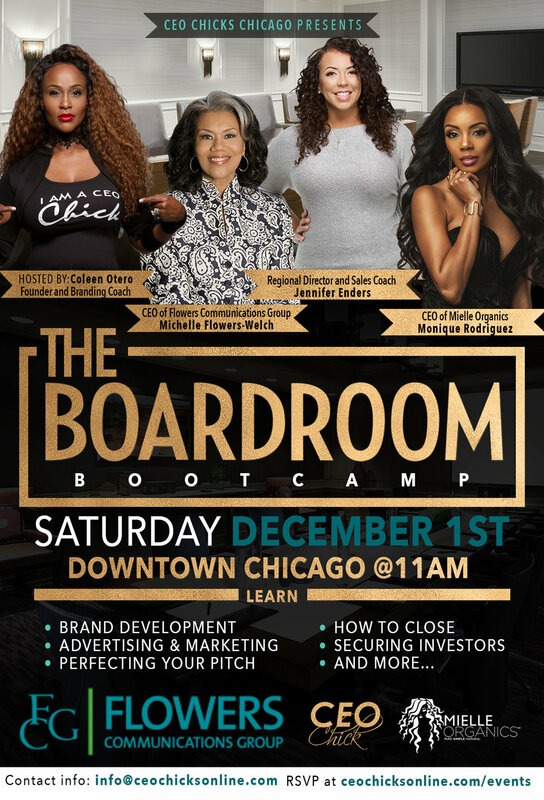 We will be downtown overlooking the Chicago River in a High Rise Boardroom making moves and building a master plan for 2019! Michelle Flowers-Welch, is the owner of marketing agency Flowers Communication Group. A visionary PR and Marketing Entrepreneur, she is an award winning expert in the field of multicultural communications. With 25+ years in the business she is founder of one of the nation's top multicultural integrated marketing agencies. Monique Rodriguez, is the owner of beauty brand Mielle Organics. With a background in science and she launched a brand in 2014 that now ships to over 87 countries and is on the shelves of big box retailers across the country. Her focus on healthy hair from the inside out, as well as a powerful social media platform she is taking the hair care industry by storm. Jennifer Enders, is the owner of a multi-dimensional coaching practice that equips women to improve performance and profitability in their lives and business'. As a certified Life Coach with 15+ years of corporate and entrepreneurial success under her belt, Jennifer utilizes her background to help business owners build strategic pricing, sales funnels and close business. Coleen Otero, founder of CEO Chicks is a 20+ year veteran in the beauty & branding industry where her expert work and products have been seen on Bravo, BET, NBC and CBS. She and her team develop "iCandy" marketing tools for her branding clients that transform their image and take their business' to new levels of profitability. Her newly released book, Brand To Bucks is at the top of numerous Amazon Best Seller Lists in the area of Coaching, Training and Business! You don't want to miss this transformational boardroom experience. This VIP event has VERY LIMITED SEATING, secure your spot today. Members use your codes for your discount.